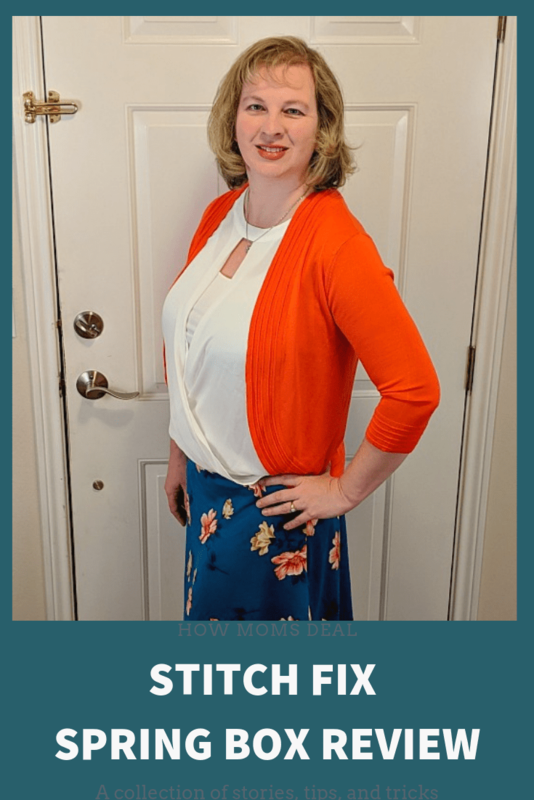 I have been having fun updating my wardrobe using Stitch Fix, a personal styling service, which has been a huge timesaver for me. I just don’t find the time to shop for myself, so it has been so nice to have someone do all the work for me & I don’t even have to leave my house but can try on the clothes right at home. My wardrobe has been in desperate need of updating, so I have been slowly adding to it with one or two Stitch Fix finds most months. 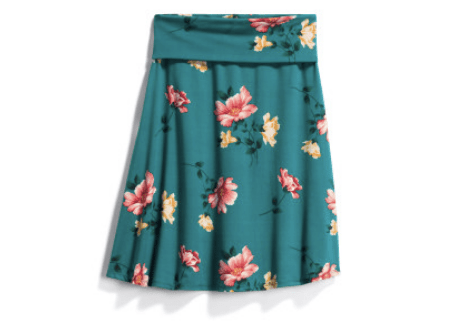 I try to order a Stitch Fix box once a month to see what new items they have for that season and this month I asked for some pretty items for spring, so I was excited to see what would arrive as spring is my favorite season & I love all the fun, floral patterns & soft colors of spring! This Stitch Fix Spring Box did not disappoint either as they sent some beautiful, items in my box. 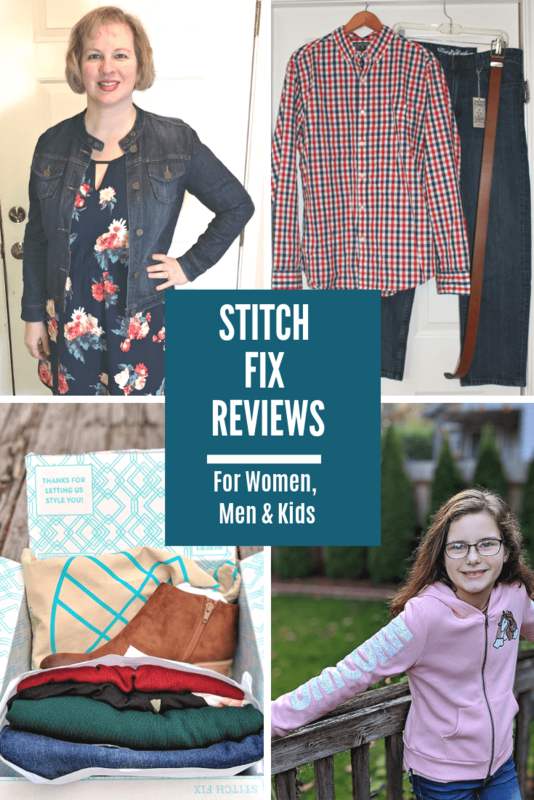 Check out all of our Stitch Fix reviews to see examples of women’s, men’s & kids’ Stitch Fix boxes. Sia just tried her first box, too, and we have to totally different styles, so you will see some different, fun looks from her! She ended up being quite a fan of Stitch Fix & found some lovely items to add to her wardrobe! Here’s my honest review of my Stitch Fix early spring box. If you have been following my last Stitch Fix boxes, I didn’t have the best luck in the last box or two, but since this was my 9th box & I have had so many great items I have found, I knew I just needed to be much more specific about what I liked & didn’t like & also to let them know more specifically what I was looking for in my box. And it worked! My new stylist for this box was definitely much more in tune with my style & she really did her research, mentioning she had gone thru my Pinterest board & I also could tell she had gone thru my feedback on previous boxes carefully based on her comments to me about the fix & the styles & patterns she chose. I absolutely loved this box she picked for me! She really nailed my style & patterns & color preferences & found some great options for spring! I kept 3 out of the 5 items, which is rare for me and honestly I was even debating keeping the whole box (remember, when you keep the entire box, you get 25% off, which in this case, was a $64 discount.) That’s a serious discount & if you like that many items, it is often worth it to keep the whole box for that extra savings! 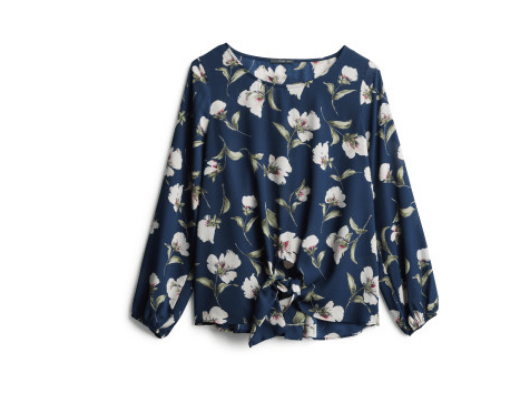 I love the spring print for this top – definitely fits my style & my stylist mentioned that she saw a similar style /pattern on my Pinterest board. I really felt this stylist did such a great job listening to the feedback I’ve given in my last fixes & going thru my Pinterest board. I loved the flowy arms, too. I love floral prints, but they have to be just right – this felt like the perfect size floral to me, not too big or too tiny. I ended up sending this back, though, as it wasn’t the best fit-wise. But such a cute top for spring! And a nice price point for this classy top! 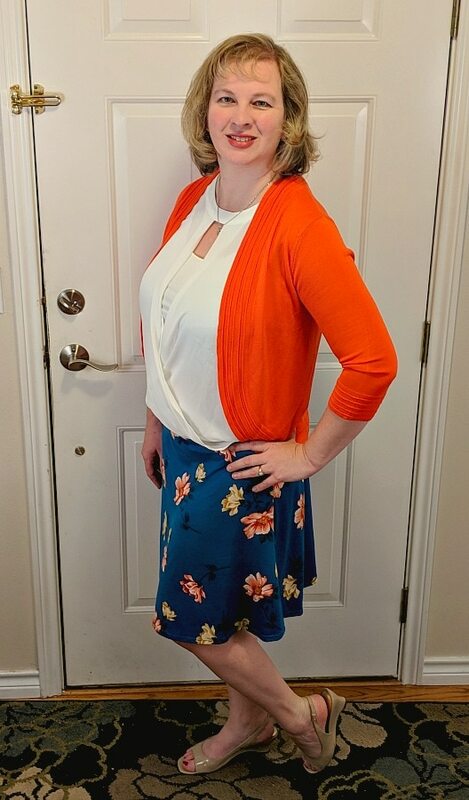 This is the outfit that my Stitch Fix stylist suggested I put together – orange sweater, teal skirt & whit blouse! It’s a cute spring outfit combo! Okay, I’ll admit, I wasn’t sure about this top when I pulled it out of the box as it is *bright*! I love bright colors, but orange is not usually a color I wear unless it’s when I’m cheering for my husband’s alma mater (Go Beavers!). So I just was not sure about this sweater….but the more I wore it around & tried it with a few different outfits, it definitely grew on me. The fit is one I love as it’s the perfect length sweater and very flattering (you can see in picture with the polka dot dress what a better fit & style it has compared to my white sweater. I loved the fit & style so much, I decided to keep it and I think it will become a favorite of mine because the style is just so flattering & comfortable. 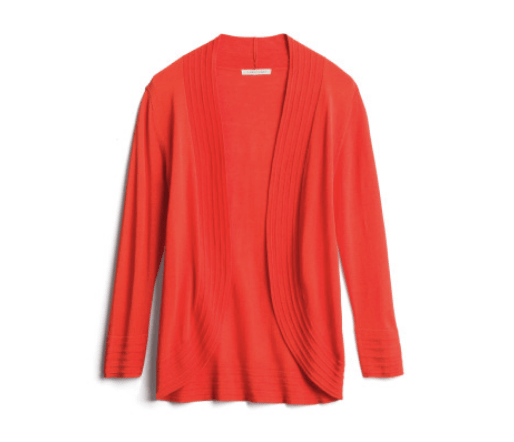 I did ask my stylist if they have any other colors for this sweater, as I’d love to find it in another color (right now, you can exchange for a different size but not color on Stitch Fix, but I thought I’d still ask if they have another color option to add to my collection)! This is such a pretty, feminine top and very flattering with the different layers to it. My stylist suggested pairing this top with the skirt & the orange sweater & it was a nice match. This top is also very cute with a sweater & jeans & I can see it being such a versatile top to wear in several seasons as a good base layer with a sweater or cute jacket. I kept this top since I don’t have a pretty white top so this will definitely be a great classic option to add to my wardrobe. I wish you could feel this skirt – it is so velvety soft & smooth! So comfortable especially with the wide, rolled waistband too. It’s such a pretty spring color with the florals & a great length too. The price point is a good price for a darling skirt! This was number one on my list to keep – I just loved it! The perfect skirt to dress up or down, depending on the occasion. 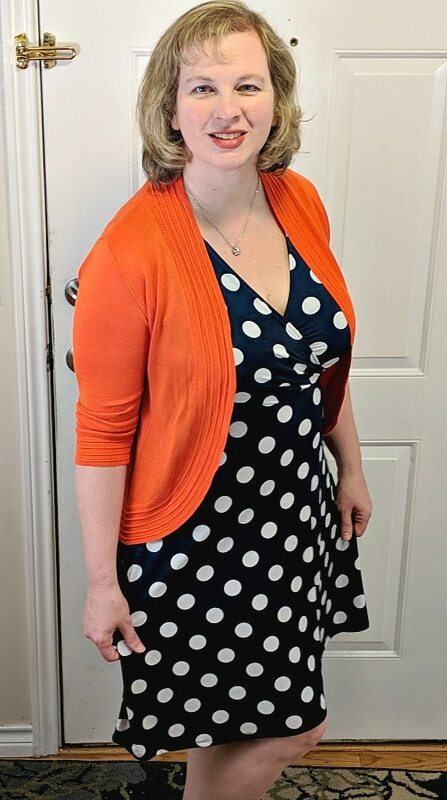 Here are two looks with this darling polka dot dress – I first paired it with a white sweater & then decided to try it with an orange sweater. I shared it on our Instagram stories (click on Stitch Fix highlights) . & asked folks what they preferred & the overwhelming answer was orange! It just is a nice pop of color with this classic dress I think. Which do you prefer – the white sweater or the orange sweater? What color would you wear with this dress? 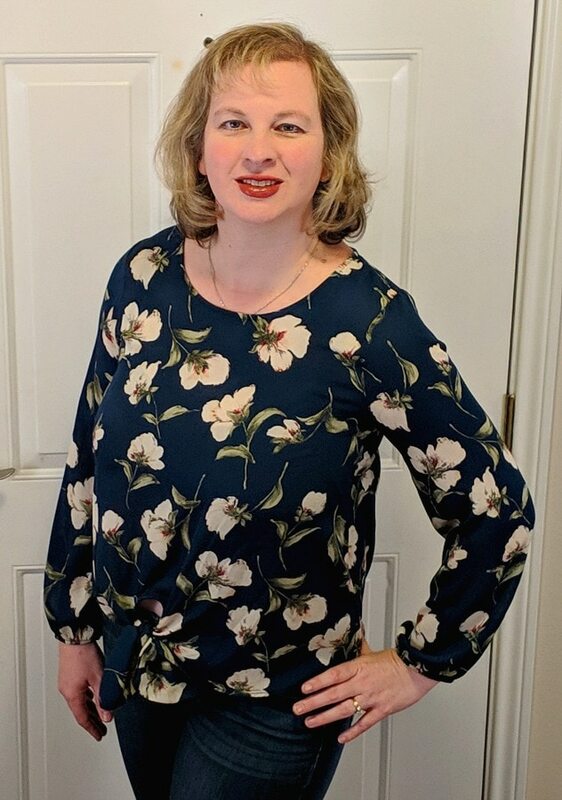 This dress is just darling – totally my style as I love the wrap style for tops & dresses as the most flattering look for me (love that they have remembered this with a number of items I have received over the year). 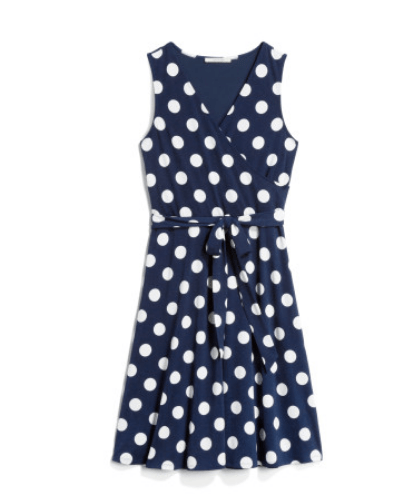 And the polka dots – one of my favorites! This is a very reasonable price for a dress too! It would be a great versatile dress to wear for different seasons – just pair it with a sweater or lightweight jacket for spring. I did end up sending this back as it wasn’t quite the best fit for me, but I think it would be a great classic dress to keep in your wardrobe! Honestly, I am kind of regretting sending it back now after looking at the pictures. Remember, you can try requesting specific items – they may not always have them, but you never know, sometimes it might work!) . This is an excellent price point for such a versatile dress too! You can see the two different color options I tried with it – a white sweater & I thought I’d just try out the orange sweater for a pop of color. Which color would you wear with it? As you can see, my Stitch Fix stylist definitely found some fun, new Spring items for me! 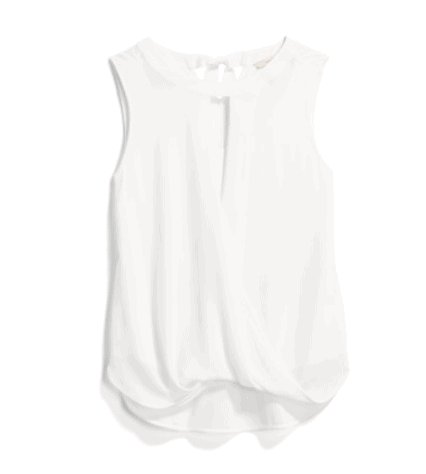 I added a classic white blouse which will be a top I wear frequently for layering. And I love the fun spring patterns & colors! Best of all, this was a stress-free shopping experience for me as I didn’t have to spend time going from store to store or searching thru pages & pages of online stores to find items that I will love! Love getting style advice from the Stitch Fix stylists to help me put together the outfits, too! Did you get any fun Spring items in your Stitch Fix box? If you’ve never tried it, head over to Stitch Fix today to test it out!